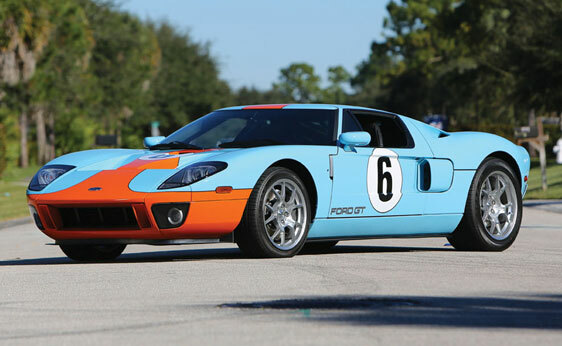 Remember when the Ford GT came out and everyone was like “Oh, good for Ford finally doing something cool?” Well while they were doing something cool, they happened to do something even cooler – sell cars in a Gulf paint scheme. In the 1960s there were a number of race cars that competed in the Gulf livery – that famous blue and orange – the Ford GT40 and GT40-based Gulf Mirage race cars among them. It is the coolest color combination you can get on a race car. Period. Well Ford painted a handful of GTs in this scheme and sold them as “Heritage Editions.” People didn’t want them. But now that the GT has become almost instantly collectible – these are the ones to have. The GT is powered by a 550 horsepower supercharged 5.4-liter V-8. Top speed is 205 mph. Only 343 Heritage Editions were made out of the 4,083 total Ford GTs built. This one has only covered 80 miles since new. It should sell for between $360,000-$400,000 – far more than the original $139,995 MSRP. You shoulda bought one when Ford was trying to move them originally! Click here for more info and here for more from Auctions America. This entry was posted in Uncategorized and tagged 2006, auctions, auctions america, cars, ford, gt, heritage edition, sports cars by classiccarweekly. Bookmark the permalink.